Hey, this is Scott and Brennen checking in from Karanga Valley Camp. Today we left Lava Tower and went up and down gradually. 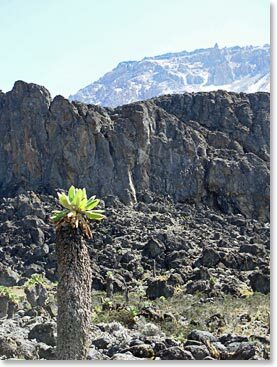 We made it to Barranco Wall which was really fun. It is about an hour or hour and a half climb that was pretty exciting. 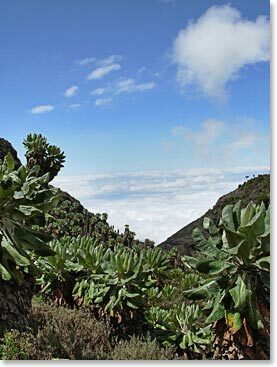 The Barranco Valley is gorgeous with big giant groundsel plants. We made it over that to the Karanga Valley down into it and then back up to our campsite at 13,900ft. Everybody is taking care of us very well. Berg is watching out for us. The food is good. Our appetites are down a little bit, but we are doing well. Tomorrow we go to Kossovo Camp. We are thinking of all of you and we can’t wait to show you pictures of all of our travels! Beautiful senecio plants were all around us today.